Le Sloughi est un chien splendidement racé qui n'a pas changé de type et de structure depuis des siècles. C'est un lévrier arabe connu en Afrique du Nord dès la plus haute antiquité. Il est originaire de Syrie et il fut surtout importé au moment des grands mouvements islamiques aux VIIème et VIIIème siècles; il se répandit en Égypte et au Moghreb, et il y conquit une place prépondérante. Sighthounds began to be imported. This was taking place some 70-80 years after the North African Sloughi became well known in France, then in the Netherlands. It is now 1952, a few years after the end of the war, and the confusion seems complete. “ The Sloughi is a splendid racy dog which has not changed in type and structure for centuries. It is an Arabian Sighthound known in North Africa since the highest antiquity. He originates in Syria and he was mainly imported at the time of the great Islamic migrations during the 7th and the 8th centuries; he spread across Egypt and the Mohgreb and conquered there a predominant place. They are then followed by a slightly altered version of the standard of the breed which had been valid since 1938. This article is a milestone in that it consolidates an era of confusion between the North African Sloughi and the smooth Middle-Eastern Saluki, which was to have a dramatic influence on some of the Western Sloughi breeding. The geographical area of expansion of the Sloughi was later extended to include Afghanistan. Did the Sloughi come from Syria and is it an Asian breed? There is in fact really nothing which proves that the North African Sloughi came from Syria and that he was introduced by the Arabs when they invaded North Africa. At the time this article was written, no one knew about the recent scientific discovery that the domestication of the dog most probably happened in China some 16.000 years ago and that all dog breeds came from China. So yes, in that sense, like all other dog breeds, the Sloughi originated in China. But if we look at the period about 1200 years ago, there is really nothing which proves that the Sloughi is an Asian Sighthound breed, and that it came from the Orient, a sentence which was put into the FCI Standard prior to the current one. It has thankfully been removed from the current standard which states correctly that the breed originates from North Africa. Already in ancient Egypt, lop-eared hounds were represented in artifacts, such as an ivory hound found in Hierakonpolis dating back to an era from circa 3400 B.C. 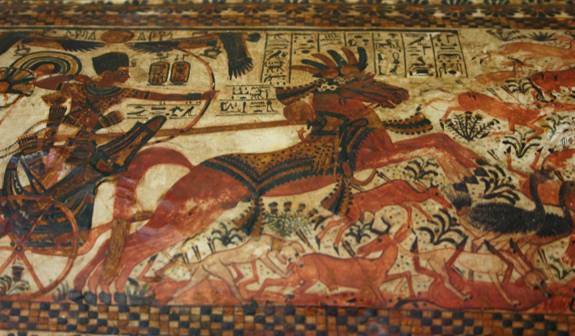 to the beginning of the Old Kingdom in 2575 B.C. 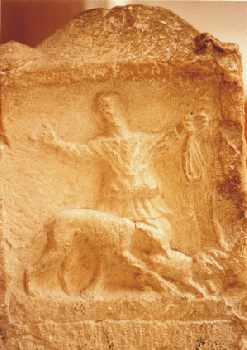 Lop-eared hound, ivory, from Hierakonpolis, Ashmolean Museum, Oxford, United Kingdom. It is argued by some that the invasion by the Hyksos (thought to have come from Syria/Palestine ) of Lower Egypt in the 17th century B.C., and occupying Egypt for about a century, brought the lop-eared Sighthounds with them. 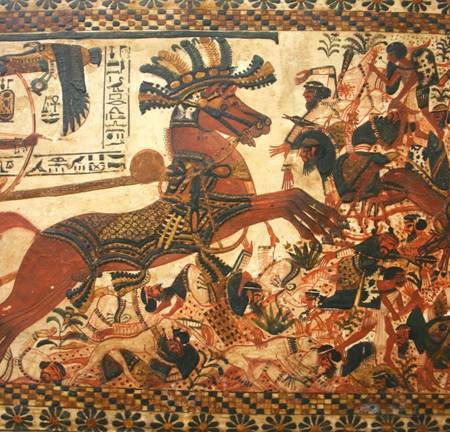 However, smooth prick-eared and lop-eared Sighthounds coexisted before the Hyksos, and the lop-eared hounds were also part of tributes to the Pharaohs which came from Punt/Nubia, which is thought to have been south of Egypt. There are many representations of the smooth Sighthounds of ancient Egypt across centuries, some of which are quite famous. For example, these Sighthounds are shown running under Pharaoh Tutankhamen’ s chariot, while he is at war or while he hunts. Pharaoh Tutankhamen, 12th King of the 18th Dynasty, 1336- 1327 B.C. 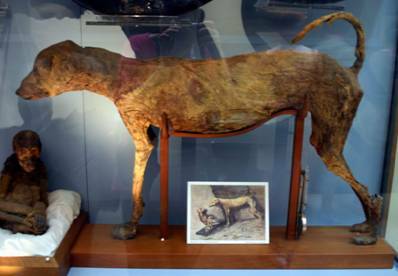 The mummy of a small sand-colored Sighthound in the Cairo Museum is also indicative that such hounds were treasured by their owners. The lop-reared Sighthound mummy in the Cairo Museum, 18th Dynasty (1550-1292 BC). Was the Sloughi introduced in North Africa by the Arabs? The Sloughi is considered to be the Sighthound of the Berber people, and another African Sighthound, the Azawakh, to be the Sighthound of the Tuareg, also a Berber tribe. The oldest records show the Berbers to have inhabited North Africa already 3000 years B.C., at the time of primitive Egypt. The Sahara was a savannah inhabited by humans some 8000 years ago. How other North African cultures and their dogs relate to the Sloughi is still unclear. The Garamantes, a people who descended from Berber and Saharan pastoralists, were recently discovered to have been a major civilization in the Sahara Desert, mainly in the Southwest of Libya (Fazzan). They are thought to have been present in that region since about 1000 B.C., and were active traders with the Romans. Eight large Garamantian cities have been recently discovered and are currently being excavated. The Berber countries suffered various invasions over the centuries, the Arab invasion being only one of them. The Phoenicians (coming from Phoenicia, the Greek name for the country and people living on the coast of Syria in ancient times at the eastern end of the Mediterranean Sea) had established the powerful Carthage (now Tunis) until the Romans defeated Hannibal and took control of the town in 202 B.C. 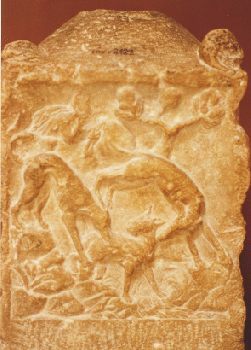 Roman mosaics and engravings in stone in the Bardo Museum in Tunis show that smooth Sighthounds were present in Tunisia before the Arabs invaded North Africa. These Mosaics however do not tell us if these smooth Sighthounds came with the Romans or if they were local and simply used by the Romans to hunt. Then the Vandals (who came from what is now Denmark) defeated the Romans in 428 A.D. and invaded North Africa, mainly Algeria and Northern Morocco. A century later, in 534, they were defeated by the Byzantine general Belisarius. From about 1045 A.D. and continuing for several centuries, Bedouin nomads from Central Arabia invaded North Africa. The Ottoman Empire (the Turks) then destroyed the Mamluk Sultanate in 1517 and conquered Syria, Palestine, Egypt and Arabia, until it finally collapsed in 1923. Arabs and Berbers fought each other fiercely, so there is some reason to believe that Berbers may not have bred their Sighthounds with those of the invaders. 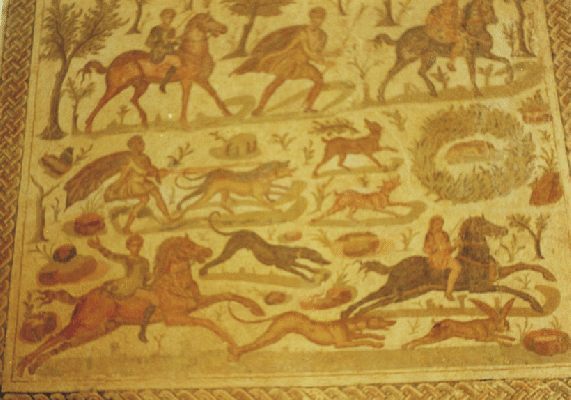 Further, if one is to believe that Arabs brought hounds with them, then one has to assume that the Phoenicians, the Romans, the Vandals and the Turks did the same. Perhaps it was also that some of these invaders took hounds from North Africa back with them when they returned to their countries. After so much time, there is really no way of knowing what happened then and how all these events may have contributed to what the North African Sloughi is today. Who the ancient smooth lop-eared Sighthounds were exactly cannot be answered. Considering the thousands of years that have since gone by, they probably were not like the smooth Sighthounds we know today. Evolution never stops, and if these ancient African hounds were the ancestors of today’s African Sighthounds, then they have evolved across the centuries to become the breeds we know today. Why is the North African Sloughi confused with the Middle Eastern Hounds? Following World War II, this confusion between the North African Sloughi and the smooth Middle Eastern Hound and later the smooth Afghani Sighthound seems to have been based only on the superficial similarity in the appearance of these breeds: a smooth and lop-eared Sighthound, whether from North Africa, Arabia, or Afghanistan. However, the little that was known then of inherited traits in breeding should have shown that breeds which come in two types of coat cannot produce puppies that are always smooth, hence cannot be North African Sloughis. Evidently, very little was known then about concepts of genetics, genes (recessive and dominant), DNA, mitochondrial DNA, parental DNA, and genetic drift between populations that are geographically, hence genetically, separated from one another. The DNA helix was first described by J. D. Watson and H. C. Crick in 1953. E. Reich and D. J. Luck described the replication and inheritance of mitochondrial DNA in 1966. The concept of Genetic Drift as a motor of evolution was presented in 1979 by M. Kimura, following his mutation random drift hypothesis in 1977. S. D. Ferris, A. C. Wilson and W. M. Brown used mitochondrial DNA for genealogical research in 1981. These discoveries showed how DNA evolves differently in populations of animals which are separated geographically, resulting in populations that become genetically different. In Biology, similar appearance does not necessarily imply similar genes; they can be the result of the adaptation of animals to a similar function which selects and results in a similarity in appearance, independently of whether the animals are closely related or not. In spite of the discoveries however, the mistaken opinion that these breeds which live thousands of kilometers away from each other are all the same breed is still alive in the 21st century for some (the defenders of the Saluqi theory), and in Europe, where some breeders have blended smooth Saluki and smooth Afghan Hound with Sloughi lines rooted in North Africa. Recent genetic studies show in fact that North African Sloughis have distinct haplotypes of mitochondrial DNA which they do not share with Salukis or Afghan Hounds. We will never know exactly how the Sloughi or North African Sighthound became what it is today. The fact remains that whatever its true story is, it is an African Sighthound breed which is always smooth-coated. Had it been brought into extensive contact with the Eastern Hounds or had it recently descended from them, it would have a feathered or long-coated variety as well, and would share extensively their mitochondrial DNA, which it does not. Therefore any serious preservation of the North African Sighthound or Sloughi should focus on the dogs as they are still traditionally bred in North Africa, and refrain from incorporating or further line-breeding on dogs that come or came from geographical areas outside of Africa. I thank Els Siebel for enabling me to use her photographs and Jack McGuffin, M.Ed., for checking the language.